Judy Lorimer, director of Build a School in Africa, visits Mali (at her own expense) each November for 3-4 weeks, with our annual contribution to help build the next school. In addition to our own regular fund-raising activities, we have received extraordinary support from individuals, schools, colleges, and organizations. Students have raised money running spaghetti suppers, car washes, neighborhood yard work, pet and babysitting jobs, bake sales, yard sales, talent shows, and other events. Generous individuals and organizations in the U.S., Canada, Europe and Australia have made substantial contributions, and every donation, whether from a kindergartener who saved her allowance to donate $10.00, or from those fortunate enough to be able to write large checks, helps build the next school. It’s a great project for kids to work on, since 100% of the money they raise goes into the construction fund. Include your e-mail or mailing address and we’ll send you a picture of the school when it’s finished. Over the years, we’ve been helped by the generous contributions from a number of extraordinary individuals and organizations. In 2009, the Binnie family raised $10,000 for the school in Mounkonkoro, which was named after grandfather Wlliam D. Binnie. In 2010, the Hillside School in Montclair New Jersey raised $10,000 to help build a school in Heremakono in memory of Alan Elder, a beloved teacher. A family in the Pacific Northwest raised $10,000 in honor of the patriarch’s 80th birthday, which helped fund the primary school in Tabarako. In 2011, two high school seniors from the McNeil High School in Austin, Texas raised over $11,500 for the school presently under construction in Sossoro. A school project, “Schools 4 Schools”, in Australia, plus some significant private donations, are helping to fund the new school in N’Galamatiebougou. These are just a few examples of our many supporters. Please consider making a small contribution and joining our movement to improve the lives of children in Africa! Learn more on our Contibute page. Horseback riders in the New England area have been helping raise funds for the project for several years, bringing their horses to the “Build a School in Africa” Benefit Trail Ride, co-sponsored by the Littleton Horse Owners Association. The ride is held in Groton, Mass. during the summer, usually late August. 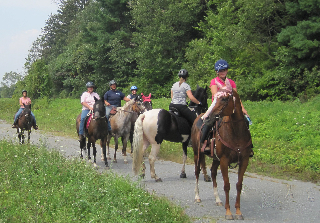 The ride starts at Willowbrook Farm; riders follow a marked trail through beautiful town and state conservation lands, choosing a route of approximately 12 or 18 miles, much of which follows the scenic Nashua River. There is an on-trail snack stop with water for the horses, and after the ride, participants enjoy a home-cooked African buffet dinner of dishes from several countries. 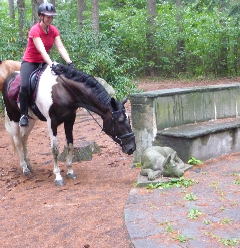 The ride is affiliated with New England Horse and Trail, with members receiving mileage credit for themselves and their horses. For information about this year’s ride, check the NEHT website or contact Judy Lorimer.